On Tuesday November 26 the Council Room at King’s College in London was filled with diehard history lovers gathered to hear Dr Günder Varinlioğlu discuss a fascinating subject: an island settlement in late antiquity. Dr Varinlioğlu is an architect and archaeologist who specialises in rural settlements and landscapes of Anatolia during late antiquity. Since 2010 she has directed the Boğsak Archaeological Survey in southern Turkey, focusing, as its name suggests, on the island of Boğsak (above), which was the topic of Tuesday evening’s lecture. Located in the ancient province of Isauria on the Mediterranean coast – and today deserted apart from occasional visiting divers and fishermen – Boğsak Island stands out from the surrounding coastlands and islands as home to a well-preserved settlement dating from late antiquity. 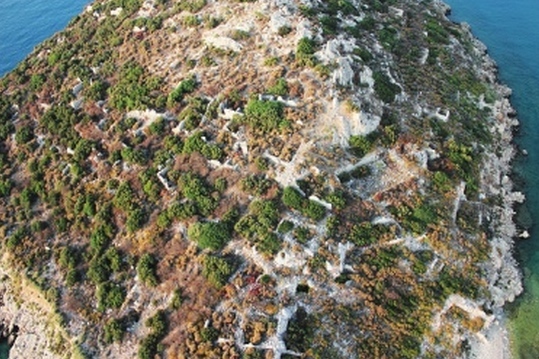 ‘Off limits until the 4th century due its rough, arid terrain,’ Dr Varinlioğlu begins, ‘a sizeable Christian settlement with complex infrastructure and architecture was created on the small island between the 4th and 7th centuries.’ Located 300 metres from the closest mainland, the island has a total landmass of just seven hectares. 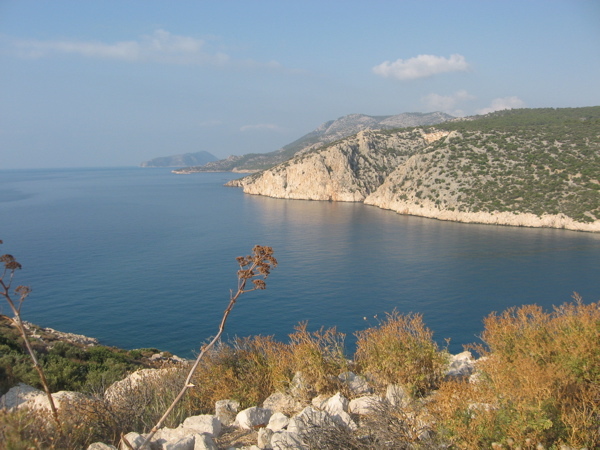 By contrast, nearby Dana Island (ancient ‘Pityussa’), 8km southwest of Boğsak, with its far greater landmass of 280 hectares, does not seem to have accommodated such a large settlement. This is of interest. ‘Written sources do not reveal much about the settlements on Boğsak Island,’ Dr Varinlioğlu continues. However, the only inscription from the island (now housed at the Silifke Museum), dating from the 5–6th centuries, records the settlement as Ἀστερήα (Asteria), which was furbished with buildings worthy of a city. ‘Thus, it can be presumed that this was a wealthy village which did not get the status of a city,’ Dr Varinlioğlu says. ‘The wide bay at Boğsak, well-protected from the north winds, must have offered anchorage, provisions and other amenities to ships and boats along this maritime route. The settlement on the island might have served as a post to control this channel, as well as to notify the mainland about maritime traffic. The island, without arable surfaces, water, wood or any other natural resources, was dependent on coastal settlements for provisioning. 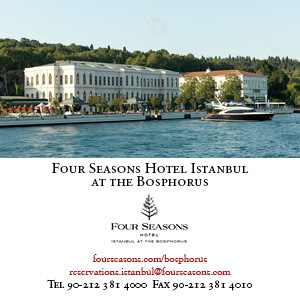 Thus, its existence and functions were tightly connected to the settlement at Boğsak Bay and the maritime trade,’ Dr Varinlioğlu hypothesises. The remains on the island have so far not been systematically studied. 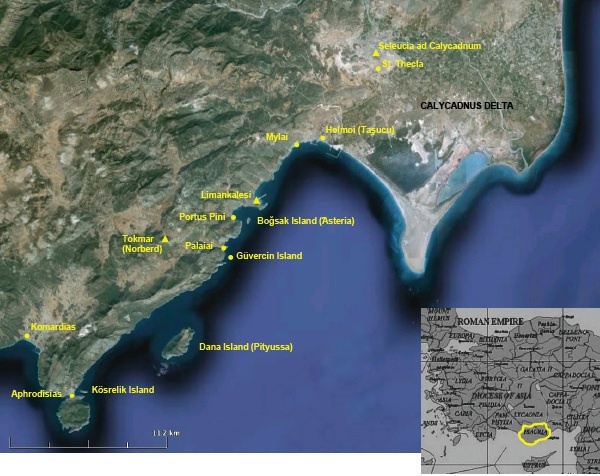 While visiting scholars have either simply left general comments on the remains or focused on single structures, the Boğsak Archaeological Survey was initiated to study the structure of the settlement, and its economic, social and religious fabric; the uses of surviving buildings and inhabited spaces; and the position of the island in the settlement network of Isaurian coastlands and islands. It is this bigger picture which most interests Dr Varinlioğlu. So what has the survey found so far? Due to the rough terrain and thick vegetation, Dr Varinlioğlu tells us, only certain parts of the island have been accessed as yet. The coasts of the island, including the south and southeast precipices, descending steeply into the sea, have been built up. Although access to the island is limited and there are no natural bays for anchoring, its northeastern and western shores have been worked into quays, breakwaters, piers, stairs and associated structures, providing anchorage and allowing maritime traffic to connect to the island. 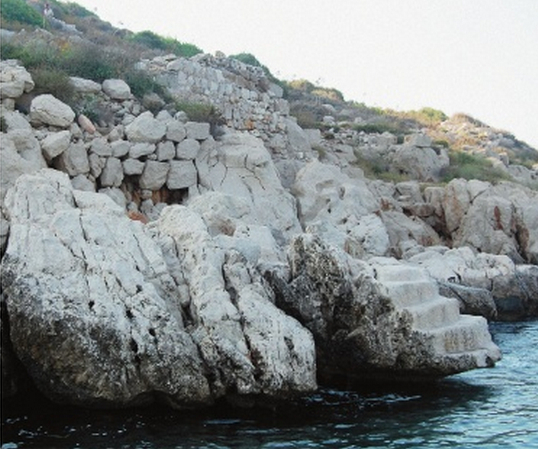 There are only a few surviving remains of stairs down to the sea. ‘These played a role in controlling access to the island,’ Dr Varinlioğlu says. The settlement covered the entire surface of the island, the densest section being the northeast slope and the eastern slope (except its southmost part), which were occupied by both independent and row houses. 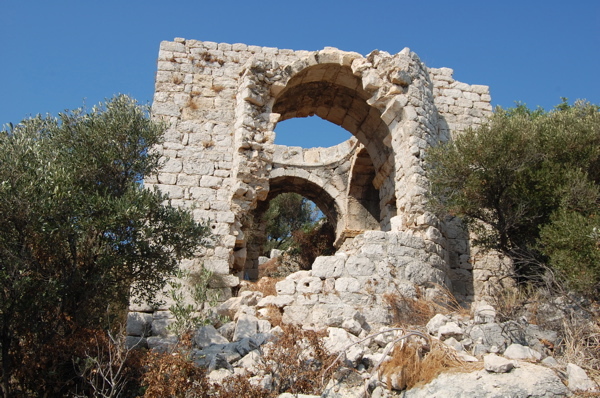 These two-storey, pitch-roofed buildings had rectangular and occasionally arched windows – the ones on the northeastern slope overlooked the Ağa Limanı and the harbour at Holmoi, and the ones on the eastern slope overlooked the maritime traffic. All the structures were built from rubble masonry bound with mortar. Roof-tile fragments embedded in the masonry were also occasionally used. Decorative elements on the structures were typical of rural Isauria during that period. 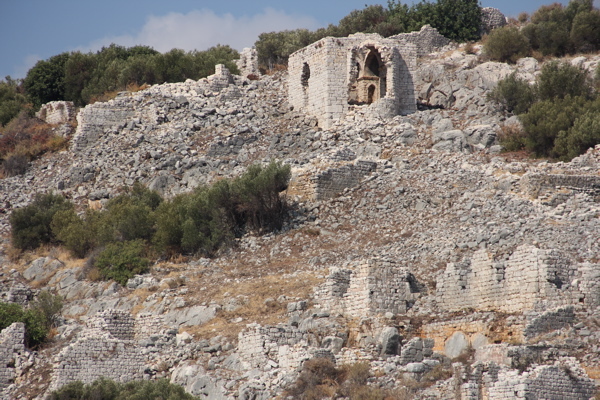 On the upper parts of the north, northeast, west and south slopes, descending from the summit, extended a large necropolis from Roman and Early Byzantine periods. 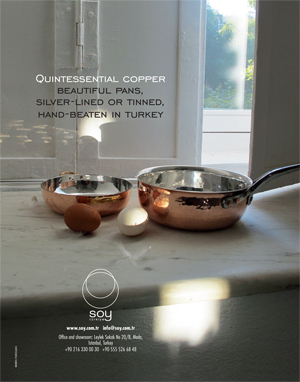 The mountainous region was ripe for olive oil production, and research indicates that olive trees and their products from the hinterland of Boğsak Bay were an integral part of the region’s economy. However, it has not yet proved possible to paint an entire picture of the agricultural capacity of the hinterland of the Boğsak Bay. 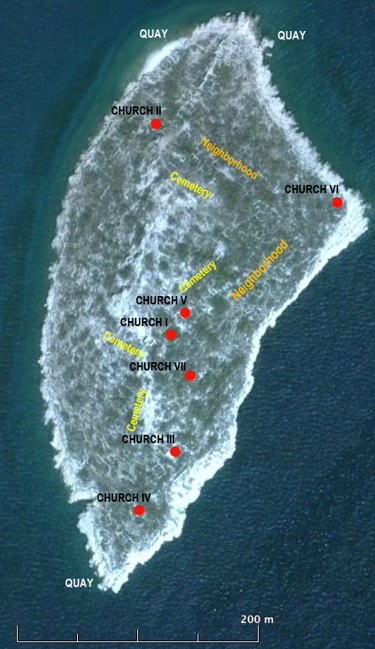 Dr Varinlioğlu’s team has identified seven churches on the island, built sometime during the second half of the 5th and the first half of the 6th centuries (these are tentaive and the actual dates are still being determined). One is significantly larger than the others; five are of relatively similar size and one is smaller, more of a chapel than a church. All the columns and capitals of the churches were made from local limestone. 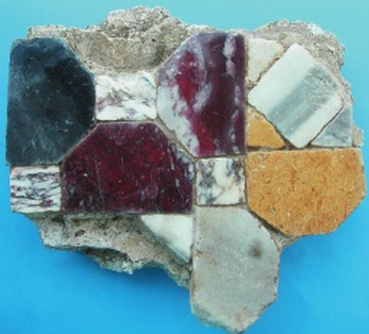 Sumptuous marble elements, including pieces of opus sectile on the pavement of some of the churches (above), as well as mosaics, have been discovered. The expensive marble found on Boğsak sets it apart from other rural settlements. A substantial amount of pottery, glass and metal remains have been found. Though the pottery is still being studied, initial results indicate they are from the 4–7th centuries. Ten bronze coins have also been discovered, all in pretty good condition. No pottery or coins have been found dating beyond the 7th century, but this doesn’t mean there was no settlement on the island after this time. Did funds run out for the original function of the island? Dr Varinlioğlu’s team is eager to conduct further investigation to bring us more on this engrossing topic. Dr Varinlioğlu is a post-doctorate fellow of Koç University in Anatolian Civilizations and Cultural Heritage Management. She recently curated and wrote the catalogue for the ‘Artamonoff: Picturing Byzantine’ exhibition (click here to read more). All images courtesy of Dr Varinlioğlu.